Hydroquinone, which is well known for its skin whitening properties, is the key ingredient in Ultraquin. Hydroquinone produces a reversible depigmentation (lightening) of the skin by inhibiting melanin production. The complete treatment for dyschromia. 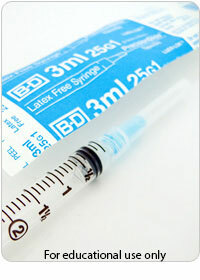 Try Latex Free 3ml syringe! PrecisionGlideTM needles are smoothe and easy to use. Two types of needles available; a larger Intramuscular (in the muscle) 25 gauge 1 inch needle for maximum intramuscular benefit and a smaller Deep Subcutaneous (under skin) 29 gauge ½ inch needle. Adults under 130 lbs may use a 29 gauge ½ inch needle to get Intramuscular benefit. 10 sterile needles / syringes come in one box. Copyright (c) 2016 buy-otc.com All Rights Reserved.